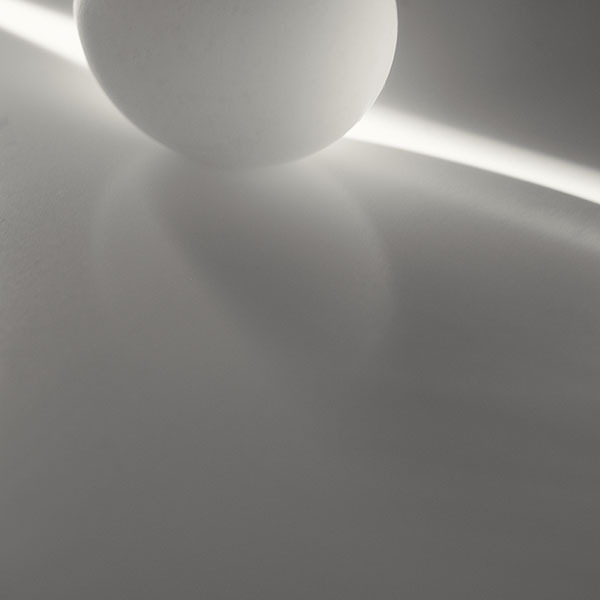 Next weekend is the Easter holiday and my photo project this week was inspired by the tradition of Easter eggs. This project was one of the first photo assignments I gave to my students when I taught photography many moons ago. 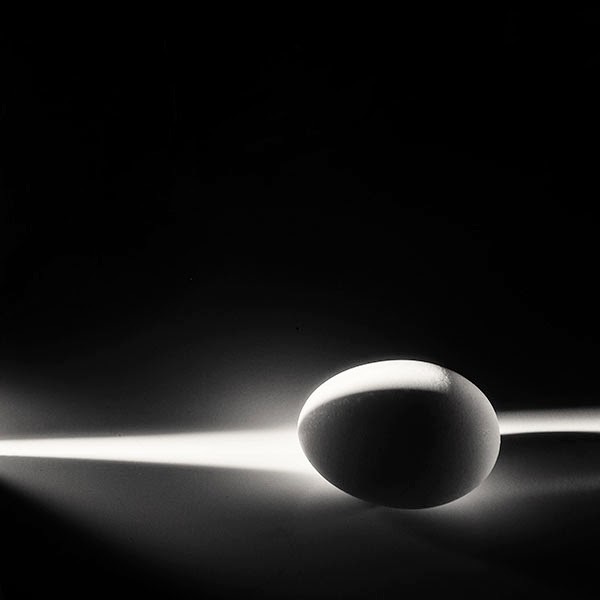 The idea was to photograph one egg using one primary light source and some silver card reflectors that could also be used as gobos to control light. The project had to be done in monochrome. 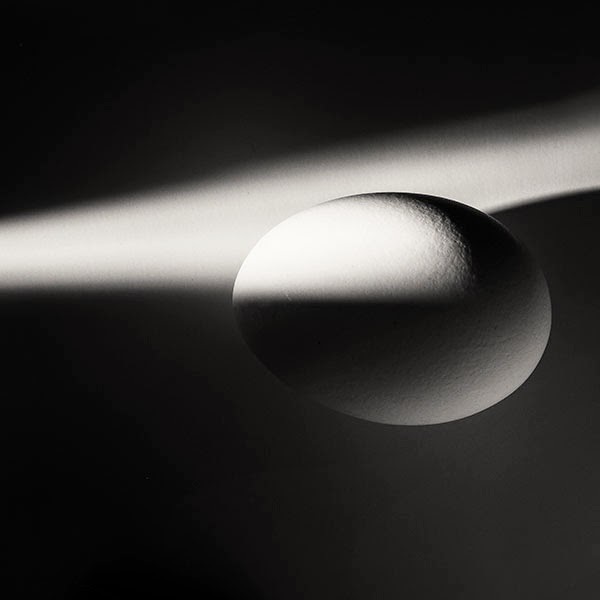 One of the rules was not to introduce any conceptual meaning into the shot by using the egg. 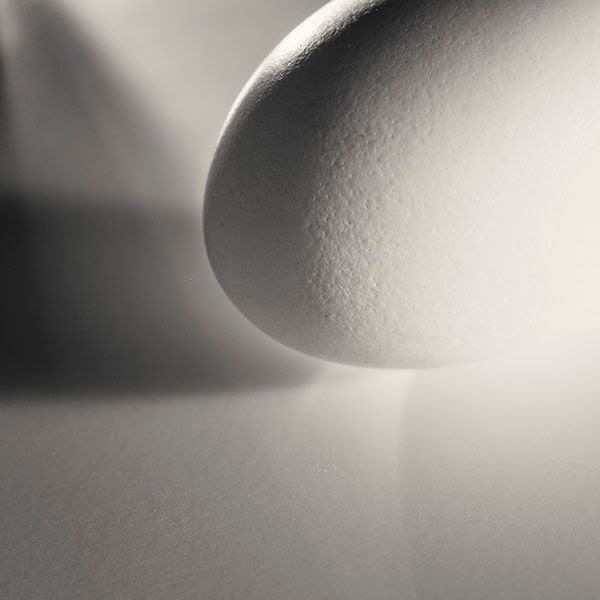 In other words, no cracked egg, not fried egg, no speckled egg -- just one pure white egg within its shell on a plain white background, and it can't be doing anything other than just sitting there. 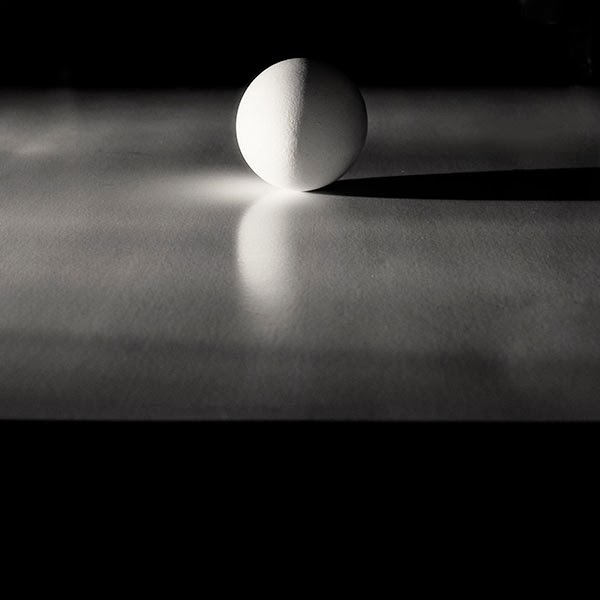 The purpose of this exercise was to introduce the basic building blocks of photography, control of light and shadow in forming a composition. That is done by moving the light, the reflector/gobos, the camera itself, and the exposure. 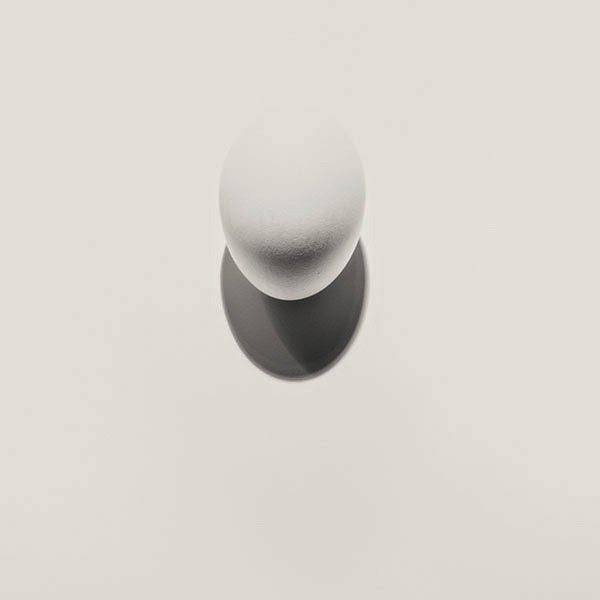 The egg is a banal subject with a distinct shape but almost no surface detail, which is why I chose it. 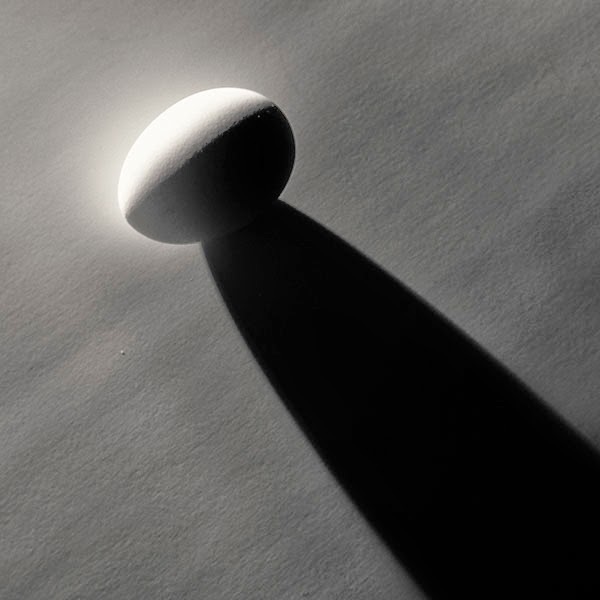 The assignment was about the light not about the egg. 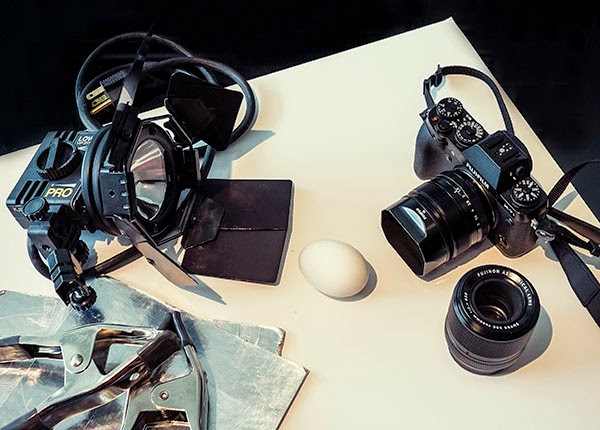 Photography, unlike most other graphic media, always starts with a subject. 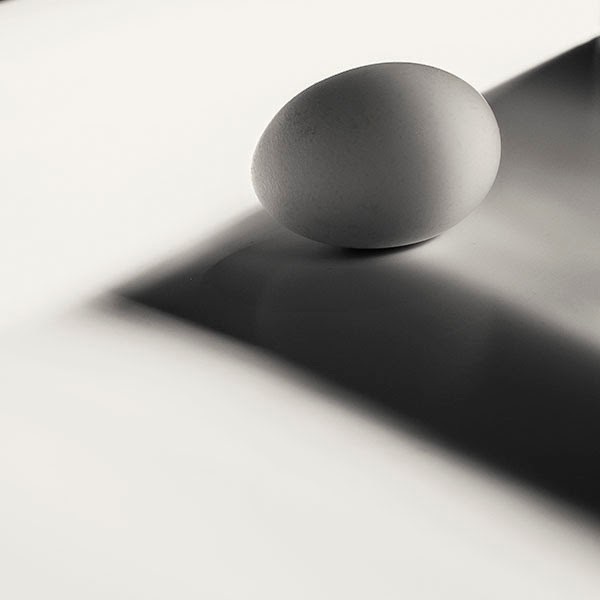 I wanted my students to learn how to look beyond the subject when composing their photographs by learning how to integrate the shape of the egg with the shapes made by light and shadow. One of the greatest masters of this technique was Cartier-Bresson, whose images always contained very specific subject matter, but had a composition structurally built upon light, shadow, and movement. 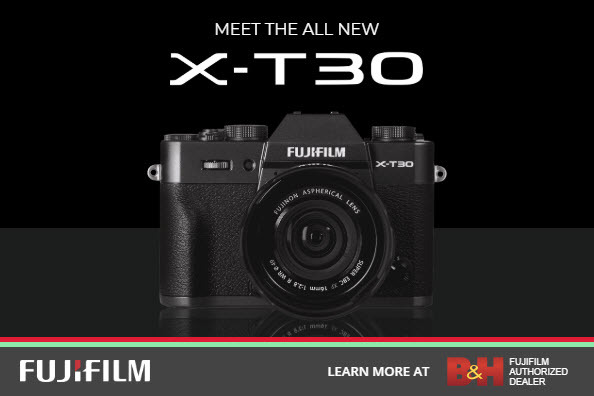 My X-T1 was back from the shop so I pressed it into service for this project. I started using the 60mm macro, but quickly switched over to the 35mm because the 60mm had a lot of trouble focusing on the egg. 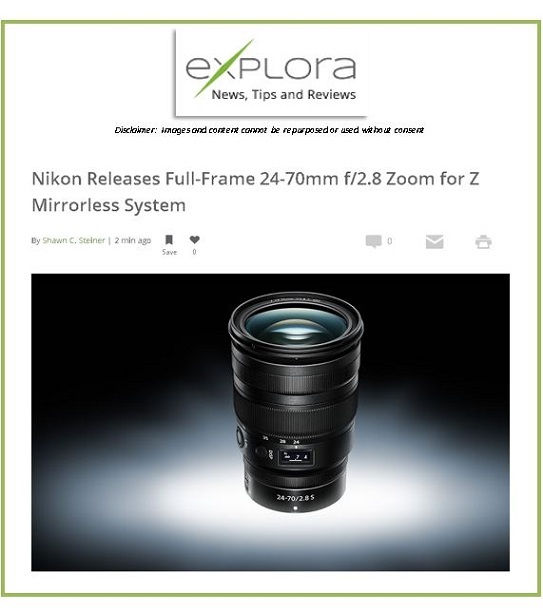 (I wonder if the Zeiss macro will be better.) To get in close I used a Nikon 4T close-up lens on the 35mm. I had the camera set to shoot jpg and RAW in a square format with the profile set to black and white. This allowed me to see exactly what I was getting and gave me a reference black and white jpg to use later in post-processing. Being able to set my camera up this way is one reason I like using the Fuji X series. I'm beginning to use the Fuji X cameras as digital replacements for my old Hasselblad 500CM. Here's the set up: a small 250W tungsten light, some silver cards to act as reflectors and gobos, a Fuji X-T1 set to square crop mode, a the 35mm and 60mm Fuji lenses. The 60mm macro had a lot of trouble focusing on the egg so I mainly used the 35mm with a Nikon 4T close up lens on it. There are thousands of ways to photograph this project. Below are some of my results. I envision most of my monochrome images as Platinum prints with its extended tonal range. Controlling tone and learning to place it where you want it is another by-product of this assignment. If any of you want to give this project a try and send in a photo, I can assemble some of them into a future blog post. 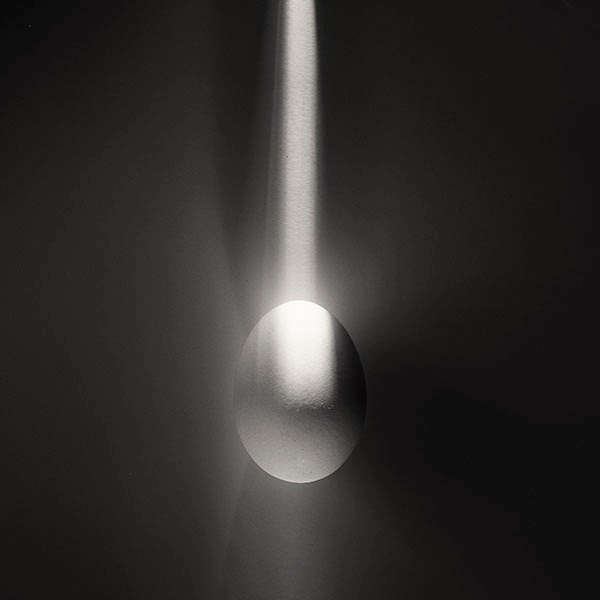 It would be interesting to see the different ways photographers interpret pure light. All the images were taken on the same white background. 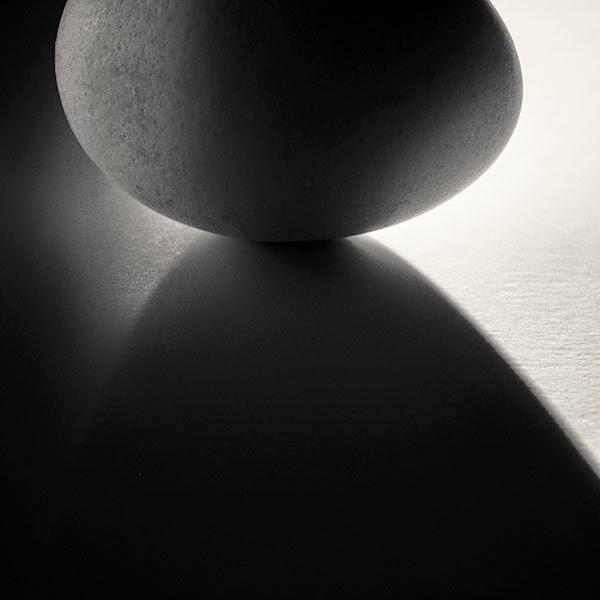 Tone, even dead black and pure white, was caused by controlling the relative exposures of the shadows and highlights. Oh, the memories! I was given the exact same assignment by our professor back in the early 80s. We proudly brought our 50 b/w photos to class and he said, I don't want to see those – go and take 50 more. The next week was to photograph a white piece of paper!